M. Gail Grant resides in Canton, Georgia, surrounded by the North Georgia mountains, submerged in the culture of southern hospitality. Her writings have a twinge of the traditional, and balance between outrageous adventures, faith, and the mystical world of wizardry. Her youngest daughter, age nine, was the inspiration behind the Magdalena Gottschalk series. Grant wanted to bring together a world of magic and enchantment within the every-day context. Watching her daughter's excitement as the books unfolded was worth its weight in gold. She hopes Lily Brooke and The Enchanted Forest bring you lots of magic and wonder. 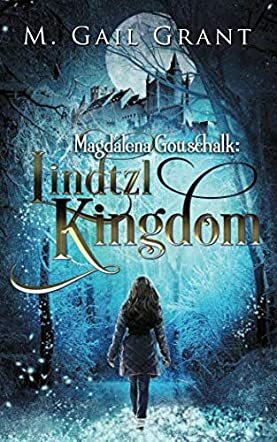 Magdalena Gottschalk: Lindtzl Kingdom is a work of fantasy fiction for preteen children, penned by author M. Gail Grant. The third book in the series which follows title character Magdalena, this one picks up right where The Slippery Slope left off. Entering The Enchanted Forest once again, the gang is indebted to Queen Lindtzl for saving their lives, and now the Queen is missing. A new evil must be afoot, slowly taking over the kingdom, and Magdalena will need her magical powers and the strength of faith to find it and defeat it. The combination of Christian and fantasy fiction collides in an all-out, action-packed novel suitable for middle grade readers aged 9 to 12. M. Gail Grant knows the characters of The Enchanted Forest well, and the bonds between Magdalena and her friends are beautifully strong for this, the third instalment in their adventures. The emotional resonance of the experiences which they have shared is very present in the book’s opening, and the tale teaches important values about serving others, resisting dark forces and keeping your spirit kind and giving. The fantasy system of the story is well imagined, with different ‘demons’ and an exciting variety of foes for the young heroes to face. Magdalena herself is, by and large, a normal girl thrown into extraordinary circumstances, and the Christian theme underlying the tale doesn’t distract from the fantasy plot, but enhances it cohesively. Overall, Magdalena Gottschalk: Lindtzl Kingdom is a recommended read in a fun fantasy series, suitable for all. Magdalena Gottschalk: Lindtzl Kingdom is an adventure fantasy novel for preteens written by M. Gail Grant. Magdalena was exploring her newly discovered abilities as a practitioner of black magic when her best friend, Gabriel, came by. She had found a small black book which her mother, a witch and the owner of Leona’s Dream Catchers, a New Age boutique, had hidden under a jar labeled “twisted shrooms.” Magdalena had seen that book before at home, and had wondered why her mom and dad were obviously trying not to let her see it. She was trying a new spell, “Levante,” when Gabriel approached her, and had been so wrapped up in her attempt that his greeting startled her and caused her to fall off the tree stump she had been sitting on. Both of them were, however, beyond amazed by the effect of that spell -- Magdalena had smoothly and easily caused a massive stone to lift off the ground and float in the air, seemingly defying the laws of gravity. Magdalena seemed to be controlling it with the force of her gaze. Then she calmly lowered her arms, and the rock gently settled back down on the ground. Gabriel was not sure he liked the idea of her playing with a book her parents obviously didn’t want her to know about and experimenting with such power. Their last adventure, while exciting, had had its moments of sheer terror. I loved returning to the little village of Lily Brooke at Christmastime, having been along for the adventure in Magdalena’s last book, but if you’re new to the series, don’t let that discourage you from diving into M. Gail Grant’s adventure fantasy novel for preteens and the young-at-heart. Grant masterfully weaves in the previous adventures of Magdalena, Gabriel and the other members of The Mystical Alliance of Lily Brooke, otherwise known as MALB, which works quite well to introduce the series as well as giving ongoing readers a refresher course. Grant’s characters are marvelous! I loved seeing Gabriel and Magdalena act as a team and was quite intrigued to see how the ungainly Hubert comes into his own. The plot is exciting and fast-paced, and will thrill anyone who enjoys spells, trolls and daring rescues of queens in distress. Magdalena Gottschalk: Lindtzl Kingdom is most highly recommended. Magdalena and the rest of MALB never want to set foot in the enchanted realm of Queen Lindtzl again, but when the queen’s dog comes to them in the middle of the night with a message they know there’s nothing else that they can do. There’s something dangerous and dark running amok in the kingdom and if they don’t put a stop to it and save the queen, it could mean the end of the entire realm. For Magdalena, Hubert, Gabriel, Piper, Cody and Greta, there’s no telling what this mission could entail, but they know it’s going to be dangerous, and it’s definitely going to involve dark forces that they have never experienced before. Magdalena Gottschalk: Lindtzl Kingdom by M. Gail Grant is a story of things never before imagined. If you’re looking for a tale of magic and mystery, then this book is a great way to go. Written from the point of view of a group of teenagers who never suspected what amazing and terrifying things lurk in the hidden realm alongside their own, it’s a tale of magical places and much more. There’s plenty of magic and lots of experiences where they’re going to have to put everything they know and everything they have to the test. But if they succeed, they’ll be able to save the kingdom and the queen. If they fail … it could mean a future too disastrous to imagine. In Magdalena Gottschalk: Lindtzl Kingdom by M. Gail Grant, you’re going to enjoy plenty of adventure and find out just what happens when friends come together to change the world.